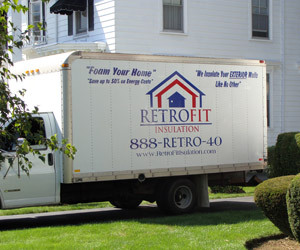 RetroFit Insulation, Inc., specializes in insulating residential homes and commercial buildings throughout New England. We are a Certified Dealer and Installer for RetroFit Foam insulation in RI, CT, NH, and ME. We also provide quality Rockwool and cellulose insulation in Masschusetts (and RI, CT, NH, & ME). At RetroFit Insulation, Inc., we know that insulation is the key to an energy efficient house, and no one installs a better insulation product to your new or older home, or business. We rely on our commitment to quality products, solid techniques, and customer satisfaction for our success. Making each customer happy, one at a time, is the only way we know to increase our business. At RetroFit Insulation, we're not satisfied until you are.